A guide to developing and maintaining a spiritual life on the job, drawn from the teachings and practices of Buddhist tradition. Most people associate Buddhism with developing calmness, kindness, and compassion through meditation. 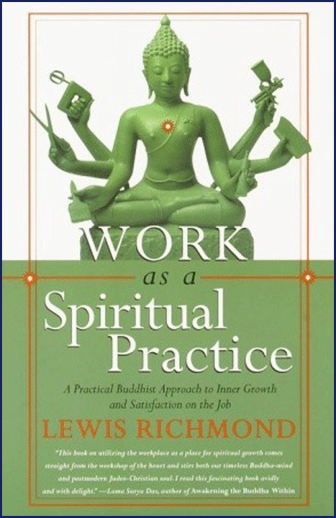 Lewis Richmond’s Work as a Spiritual Practiceshows us another aspect of Buddhism: the active, engaged side that allows us to find creativity, inspiration, and accomplishment in our work lives. With over forty spiritual exercises that can be practiced in the middle of a busy workday, Work as a Spiritual Practice is based on the principle that "regardless of your rank and title at work, you are always the chief executive of your inner life." Work as a Spiritual Practice is an essential guide for anyone who wants to bring his or her spiritual life and work life together. LEWIS RICHMOND is a Buddhist teacher, workshop leader, software entrepreneur, and musician/composer. Formerly Executive Vice President of Smith & Hawken, Ltd., he is the founder and owner of Forerunner Systems, Inc., the leading provider of inventory management software to the catalog industry. Lake of No Shore, his debut solo piano album, was released by Artifex Records in February 1999. An ordained disciple of Buddhist master Shunryu Suzuki Roshi, Mr. Richmond co-leads Dharma Friends, a meditation group in Mill Valley, California, where he lives.